Amanda McCarthy started as a volunteer with Sienna in 2007, and quickly turned her passion for helping residents live fully every day into a career. She soon joined Lake Country Lodge Care Community as a part-time recreation assistant, while she simultaneously pursued her post-secondary education to become a Licensed Practical Nurse (LPN). In March 2010, with credentials in hand, Amanda was promoted to the position of full-time nurse. Over the years, Amanda has worked at both Lake Country Lodge and Glenmore Lodge, and says her favourite part has been contributing to the quality of life for residents with dementia. Amanda says she shares the warmth of human connection every day on the basis of equality and respect for all. “A nurse’s compassion, humour and willingness to listen can help provide residents with a level of comfort and security, and it may help make them feel they have more control over their challenging circumstances. 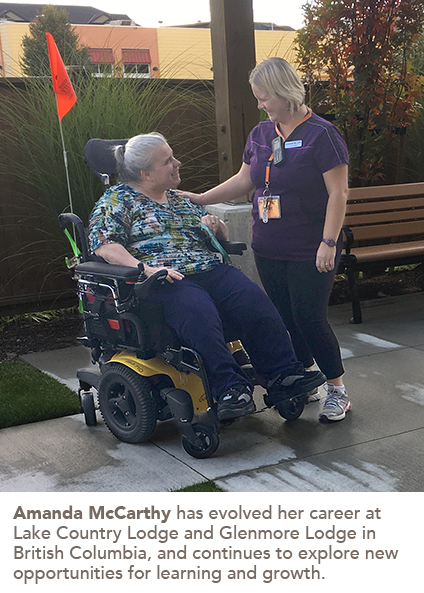 This emotional support can be invaluable to a resident’s overall well-being,” Amanda says. She has been nominated twice for the BC Care Provider of the Year Award, as well as taking on maternity leave coverages and challenging roles as a Clinical Lead.